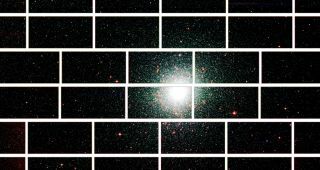 This zoomed-in image from the Dark Energy Camera of the center of the globular star cluster 47 Tucanae, which lies about 17,000 light years from Earth. A new telescope camera in Chile focused on mysterious dark energy has taken its first photos of extremely distant galaxies. The images represent the first observations — called "first light" — of an instrument called the Dark Energy Camera that was eight years in the works. "The achievement of first light through the Dark Energy Camera begins a significant new era in our exploration of the cosmic frontier," James Siegrist, associate director of science for high energy physics at the U.S. Department of Energy, said in a statement. "The results of this survey will bring us closer to understanding the mystery of dark energy, and what it means for the universe." This photo from the new Dark Energy Camera, taken in September 2012, shows the barred spiral galaxy NGC 1365, in the Fornax cluster of galaxies, which lies about 60 million light years from Earth. The Dark Energy Camera is designed to study this puzzle by mapping out the distant universe to more accurate pin down its current and past expansion rates. "The Dark Energy Survey will help us understand why the expansion of the universe is accelerating, rather than slowing due to gravity," said Brenna Flaugher, project manager and scientist at Fermilab. "It is extremely satisfying to see the efforts of all the people involved in this project finally come together." The new instrument — a 570-megapixel camera — took its first photos on Sept. 12, taking aim at a portion of the southern sky from atop a mountain in the Chilean Andes. The Dark Energy Camera was built at the Fermi National Accelerator Laboratory (Fermilab) in Batavia, Ill., and was installed on the Victor M. Blanco telescope at the Cerro Tololo Inter-American Observatory, the southern branch of the U.S. National Optical Astronomy Observatory (NOAO). Each photo by the camera can capture up to 100,000 galaxies as far away as 8 billion light-years. "We're very excited to bring the Dark Energy Camera online and make it available for the astronomical community through NOAO's open access telescope allocation," said Chris Smith, director of the Cerro-Tololo Inter-American Observatory. "With it, we provide astronomers from all over the world a powerful new tool to explore the outstanding questions of our time, perhaps the most pressing of which is the nature of dark energy." In December, after the camera is tested, it will begin the Dark Energy Survey, the largest galaxy survey ever undertaken, by mapping one-eighth of the sky. Researchers estimate the survey should spot 300 million galaxies, 100,000 galaxy clusters and 4,000 exploding stars, called supernovas.